Kitten fostering is volunteering to take a kitten into your home and caring for them until there is room for them in a rescue or shelter, or until the kitten is old enough to be spayed or neutered and adopted. When you foster a kitten you are saving a kitten’s life! Most shelters don’t have the resources to care for kittens which lead to an extraordinarily high euthanasia rate amongst kittens. 1. Understand your responsibilities. Before you take on the responsibility, make sure you understand that fostering a kitten can be time consuming, and entails socializing and feeding and cleaning up after your new furry friend. Setting aside time for your kitten will ensure that foster kittens receive the time, care, and attention they need. If you won’t have time to provide the proper level of care and interaction, fostering might not be for you. 2. Be prepared. Many foster programs will provide you with supplies, but don’t assume this will be the case. Purchase a litter box, water bowls, toys and other accessories you may need while fostering the kitten. The investment is small but the returns are great! 4. Training. Remember that you are preparing the kitten for its fur-ever home. Just like humans, it’s always best to start training as soon as possible. You will want to make sure the kitten will grow up to be a good cat citizen by teaching it right from wrong. 5. Goodbyes. Fostering a pet is temporary. While it can be difficult, we recommend against becoming too emotionally attached to your foster kitten. Keep the cuteness going by taking lots of photos and sharing them on social media so all your friends can see how fun fostering can be. Prepare yourself to say goodbye once the kitten is ready for adoption and consider fostering again in the future! ©2014 Robin A.F. Olson. Just 4 of the many kittens Kitten Associates has available for adoption -just saying'. If you can do all the above and are ready to foster a kitten, thank you for saving a life! Also, support campaigns such as Found Animals Adopt & Shop’s #100kittydays campaign. 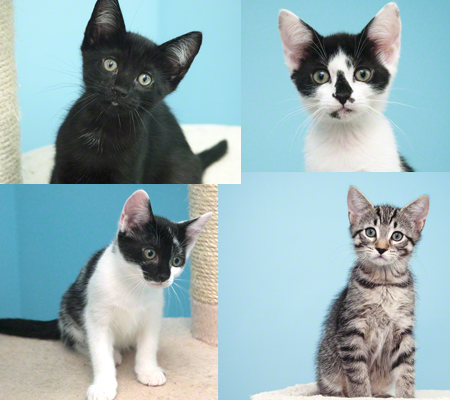 During the campaign, Adopt & Shop  hopes to adopt 500 kittens in 100 days this kitten season. Just like Robin’s nonprofit Kitten Associates , we're huge supporters of fostering kittens until they find their fur-ever home. Now, let’s save some lives!